San Francisco (Obama.net)- With the recent combat in the Yellow Sea between North Korea and South Korea and the subsequent threats made by North Korea pertaining to resuming the Korean War and attacking South Korea more, the leaders of the international community are growing impatient and are taking action. Monday, the top diplomats from Japan and South Korea will arrive in the United States to speak with American officials, including Hilary Clinton, the Secretary of State, about how to handle the situation as tensions continue to rise. 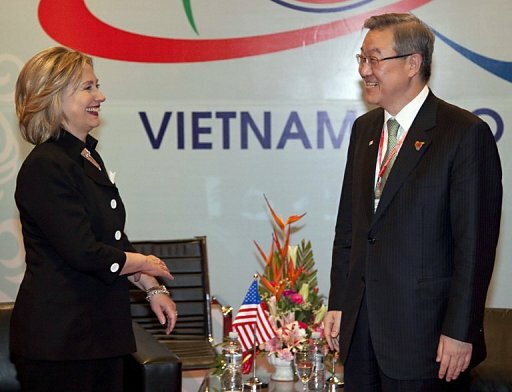 Japan’s Foreign Minister, Seiji Maehra will meet with Clinton privately before they meet with Kim Sung-hwan to formulate a final plan of action. North Korea is still reporting in its media that the South is responsible for the recent escalation of problems and that the military drills of South Korea are not just drills, but threats against the Northern state. Most likely leading to the displeasure of the North Korean government, on December 10th, the United States and Japan will come together for the biggest military drills ever between the two states. The cooperation of China, as well as Russia will be sought by the United States, South Korea, and Japan as the situation progresses. China and Russia were also part of the Six Party Talks that have been going on in recent years. The United States is hoping that China will use its influence over North Korea to keep the isolationist state in check and keep them from further attacking South Korea or shifting their focus to Japan. With the Korean War essentially on pause for the past 57 years, the last thing anyone in the region wants is for the combat to be restarted with modern weapons and with Kim Jong Il at the head of the northern state. The talks on Monday are the start of what will hopefully be a swift process that will be bring the tensions between North Korea and South Korea to a halt.